I went for a walk this afternoon, around my local area, and couldn’t help feeling a deep love for the place I’ve come to call home. North Queensland has its own rhythm of seasons and at this time of year, the north waits. We’ve braved the dry spring and early summer and the first showers have graced us with their presence. We wait for the start of the wet as the monsoon inches its way towards us from the north. We wonder if we’ll have to face a cyclone this year. The storm bird calls and the crickets serenade us in the early evening. The frogs delight in the barest hint of rain. We hold off on watering just in case a shower should drench us overnight. Our prayers beg for rain during the week, leaving the weekend free to play cricket, mow the lawn or go fishing. Of course, when the wet comes, none of these things are possible and so we wait, longing for the rains but knowing that they will be relentless, flooding, mould-inducing and seemingly never ending. And when the rain comes and there’s nothing to do but sit inside and write, perhaps then I’ll make real progress on my writing tasks for 2013. It’s been hard to get back into the routine after the Christmas break; back to work, back to writing, back to the miriad of tasks that have lain neglected over the holidays. As nice as the holidays and sleeping-ins are, I’m looking forward to life resuming a normal rhythm of early starts, children off to school and clawing back my writing routine. Ah, yes, there’s no denying the romance of the rainy season in North Queensland. Bring it on! ← All The Best For 2013! Lovely post, Bernadette. We have a chorus of frogs down here whenever the rain comes. A big beautiful green one is always sitting at our front gate. I’m off to walk Mount Warning in the morning, so am sure to see lots of wildlife. Happy so long as it is not the slithering kind!!! Have a great day tomorrow Jen and congrats on the release of Seducing the Secret Heiress. Can’t wait to read it! And the rain has arrived in Cairns so hopefully it’s headed your way as well, Bernadette. It’s a perfect day for cooking up a storm or curling up with a book! I love that you are waiting for the big wet… I’m not so sure I could wait for the monsoon type weather patiently, give me a thunder storm, and the sunshine comes back out anyway! 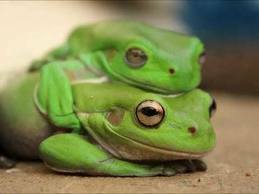 Love your frogs! They must be cousins to my ones here…so beautiful! Thanks Tina. Hope all is well in your neck of the woods.